We are engaged in offering a wide array of alluring range of Western Wear at industry leading prices. Our garments are made by adept designers using quality fabric material and latest technology & machinery. We design our products as per the latest trends and requirements of our customers. 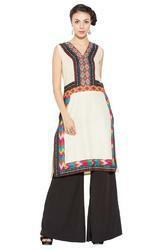 This solid white, kurti by Nikhaar comes with black highlights embroidered across the bottom and on the shoulders. It has a round neck with a tie-up and is sleeveless. This comfortable, cotton kurti is best suited for casual wear and pairs well with black leggings/chudidars. Tops western dress , so now skinny, loose, baggy, funky and frocks tops, western style. As the fashion designers are very keen in recognizing fashion trends and they are bringing there collections match with latest style, Similarly Indian designer has brought of matchless series of Best western style Tops. Nikhaar bring to you this beautiful, white, sleeveless kurti. It has a round neck with a colourful embroidered patch below and pink, patterned highlights along the sides and across the bottom. This cotton kurti is best suited for party wear and pairs well with pink or black bottoms. The western top we offer looks traditional and western style of clothing. This top has short sleeves this top is an eye catcher. This western top is made of good quality fabric Top that is looks best as a casual evening wear Western Tops and latest kurtis for girls to wear in official meetings, casual and other day wear events. Designer has used different techniques to garnish the kurtis like crafts designs. We are manufactrer,exporter of designer stylish trendy designer party wear suits. We are offering huge collection of desigenr kurtis having Indian Formal,Semi Indian,Casual,Party Wear With Embroidery Work,Machine Work,Patch Work.Bead Work And Many More. We Offer Stylish With Trendy Look Designer Long Suit With Pleasant Colors.This evening dress is full length and elegant. It features adjustable drawstring which can be tied to front neckline for comfortable fit. A matching waistband is detachable and it will greatly slim your waist. It is suitable for this season We design and develop a superlative range of pakistani salwar kameez. Our pakistani salwar kameez are fabricated from high quality fabrics. We are the best if you want the finest Pakistani dress wholesale in India .Its a Indian Pakistani Bollywood hot fashion designer Ladies Salwar suits kameez..
We are offering Designer Kurtis Tunic which are fabricated using pure cotton fabric and can be embellished, designed and styled as per the different requirements of the customers. We have a multiple range of Ladies Kurta Kurti Top Tunic of Varied price order and design patterns. Our fine and delicate weaved fabrics are tested for the tear strength and shrink Resistance before being designed to perfection. Due to their latest designs, attractive patterns and beautiful colors, these tunics can be worn at both casual and party occasions. These designer Indian Suit give you a smart and classy look ... This is a latest Tunic Fashion dress consists of skinny jeans in navy blue color and a fabulous sleeves with rough and baggy style of neck type which gives casual touch to this dress. All such types of dresses are basically for casual use…..Offered designer Suits are the perfect combination of contemporary and traditional designs. These kurtis are available with us in alluring designs, beautiful colors, patterns and sizes. These designer Indian Suit give you a smart and classy look ... This is a latest Tunic Fashion dress consists of skinny jeans in navy blue color and a fabulous sleeves with rough and baggy style of neck type which gives casual touch to this dress. All such types of dresses are basically for casual use…..
Pakistani Dresses are very famous and highly preferable clothing wear World wide. Pakistani Designer Suits are best fashion wear with outstanding quality as well as the fabric has enormous edge over others. farwacouture have ability to supply all branded Pakistani Suits. We deal in Stitched Dresses We also make custom size suits as per your design, These designer Indian Suit give you a smart and classy look ... This is a latest Tunic Fashion dress consists of skinny jeans in navy blue color and a fabulous sleeves with rough and baggy style of neck type which gives casual touch to this dress. All such types of dresses are basically for casual. These designer Indian Suit give you a smart and classy look ... This is a latest Tunic Fashion dress consists of skinny jeans in navy blue color and a fabulous sleeves with rough and baggy style of neck type which gives casual touch to this dress. All such types of dresses are basically for casual use…..Offered designer Suits are the perfect combination of contemporary and traditional designs. These kurtis are available with us in alluring designs, beautiful colors, patterns and sizes. Ladies Kurtis that have been fabricated from a fine grade of linen. Procured from some of the authentic and trust worthy mills, these fabrics are stored in pest and rodent resistant Ware housing facilities at our Sophisticated infrastructure. The sophisticated warehousing are necessary for longterm storage and safe delivery to the clients. We offer varied payment mechanism and shipments to reduce cost of final good....Due to their latest designs, attractive patterns and beautiful colors, these tunics can be worn at both casual and party occasions.